Pyrometers - Page 2 - Miata Turbo Forum - Boost cars, acquire cats. Couldnt you do that already with some creative wiring and the 8 thermocouple driver from DIY? Also, laser temp sensors 3/wheel would be really cool. IRRC we have some kicking around in the shop that someone bought a couple years ago that were surprisingly cheap. Mounting them properly is the killer, Something stiff involving a shaft collar onto the shock body would likely work. 3 Sensors Per tire special !!! No idea how accurate or how useful. Would be placed in front of wheel, under a shield for stones etc. Old-school core temp are more linked to old-school changes. There might be an advantage to learning to drive differently to make the tires work better in average (and using live analysis out on the track as feedback), but I would think it would be hard to do. Here a full color image of the surface would be easier to take in. Logging temps patterns could help with shock setup (dynamic behavior), but we are getting into areas where the old-school black art (chaos theory in the experienced engineer's noodle) already makes a good job. Last edited by NiklasFalk; 05-07-2013 at 09:54 AM. These are a bit more accurate, and cheaper too. But you'd need to figure out how to handle the signal, and mounting them would take more work. That's only slightly more $ than a memory pyrometer and could conceivably be patched into my AiM Data logging. Anyone have views on the new combination pressure gauge/pyrometer that Longacre is offering? It can also do temperature compensated pressure readings. I have one of these (Longacre 50620 dual probe / IR) and I'm quite fond of it. The rest of the recording system is my brain (I've had to train myself hard to remember three numbers at a time), preprinted log sheets (DIY in Word), a pen and (something essential) a clipboard. Because I slow down as soon as I get a checker, and do a tour around the paddock if things are scorchio, getting a read on absolute temps isn't going to happen. But I figure (hope I'm right) that what I'm interested in most is relative temps across the tire re pressures and camber (for next time it gets aligned). The IR gun part is useful both at the track - two weekends ago at Thunderhill the pavement temp was one million degrees - and around the house. - Honey, is the freezer cold enough? - Honey, is the oven temperature dial accurate? - Honey, are my homemade pickles pickling at the right temperature? That system requires one differential analog voltage channel per sensor. So you need 12 free analog in channels to log that. That's a lot of money on AIM expansion modules. These are what I am using. I sourced them for under $10 a piece. You can read as many sensors as you want with just two digital pins using I2C communication. I'm able to read 16 sensors in under 5ms so I can log at 200 Hz (unnecessary for tire temps). As for mounting PCB boards with 3d printed enclosure for the 3 sensor array. Bracket off the upright is going to be tricky tho. It honestly Is a lot of work for live IR Tire temp arrays. Doable but not easy. I'm considering just running a pyrometer too. How deep do you insert the pyrometer probe? I get that you want it to be deep down with the cords, but I am worried about popping the tire. I am considering making some sort of simple stop to get the probe to the right depth consistently, without having to worry about bursting the tire. There are probably memory logging thermocouple thermometers available for not much more. The probe linked has only a 5mm long tip. That is a little over 3/16 of an inch. You should be able to bury that gauge and not burst a tire. Bury the entire probe in the tire. It's far thicker than you think. 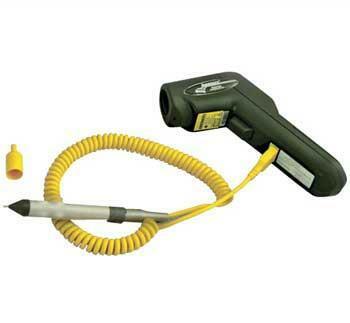 IR Tire Temperature Array Data Logger - Any Interest? Incorrect readings from temp sensor? Or is it my Link?